The village consists of Braidwood Inn, Steamscorch Mine (a Malachite mine) and an encampment containing three tents used by the miners. There is a smelter outside the mine and a grindstone beside the inn. 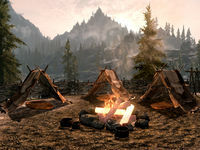 Alongside the camp, there is a vegetable patch containing six leeks, four gourds, eight potato plants, and ten cabbages. A wood chopping block and a tanning rack also lie near the vegetable patch. A short distance downhill from the inn is a chicken coop consisting of two chicken nests for the two chickens that wander the town. There are a number of dragon's tongue plants around the town as well as a nightshade plant and a snowberry bush around the camp. Uphill to the south are some beehives and red mountain flowers among the trees. To the east is a dragon mound where the dragon Sahloknir is resurrected by Alduin during the A Blade in the Dark quest. Despite Ganna Uriel mentioning that she and her sister built a lumbermill at Kynesgrove, it is nowhere to be found. 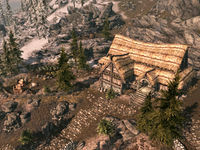 The Creation Kit identifies the bank of the river just down the hill from Kynesgrove as Frostbark Lumber Mill, which suggests that the location she describes was cut from the game. Kynesgrove also appears in ESO. This page was last modified on 12 February 2019, at 00:14.